You know what I love about 2 year olds? How egocentric they are. It's what earns them the 'terrible twos' moniker, and I find it oftentimes hilarious and endearing. A couple of months ago Reid starting referring to himself in third person. Nothing warms my heart more than a toddler referring to himself in third person. Nothing, that is, except for a toddler referring to himself in third person as though he is, in fact, The Only Person On Earth. That's right folks, The Reid is in da house. It's not just Reid anymore. It's The Reid. He's titled. Next thing you know, he'll be knighted. The Reid NO WANT dinner! The Reid want play with trains! The Reid is now signing copies of his official, licensed novelty poster for tweens across the nation. To order yours, just call 1-800-THE-REID. 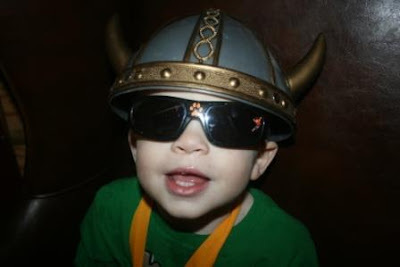 Viking warrior helmet not included. The REID looks just the Reid's older brother and the Reid's daddy in that picture. Do you get the glasses? With those I would be The JDaniel4's Mom. Yes that is such a fun age! That's awesome. JBird has only done the third person once. I know how Reid gets away with it-he's so darn cute! And at Amy's high school? There are a few incredibly egocentric teens. Not cute at all! Hahaha! Very funny! Great photo! LOL... so funny!! He is a real cutie pie. How adorable! Whenever I hear someone refer to themselves in third person I always think of Bob Dole....he did that. It drove me nuts to see his ads on TV. We have the same helmets at our house! Respect to ma main man The Reid! I am laughing so hard!!!! This is one of the funniest posts I have ever read. And let me say it is no small feat to retain such a joyful sense of humor with three little children running around!! Phil has gone off to his computer now, because I told him to read it. I can already hear him laughing from all the way down the hall!!! THE Reid is ADORABLE... What a cute picture and post, Lisa... Hope you are writing all of the funny/crazy things that your kids are saying.. Might make a good book sometime. Haha! The Reid is a cutie pie! Reid is too cute...2 year old kids are adorable. The Reid is too, too funny! Great job you're doing there; Reid is definitely not lacking in confidence!! The photo is adorable. Does he by any chance have Viking blood? So funny - The Reid sounds like quite a character! He is too cute! I love the name Reid too:) Hope you are having a great weekend! Haha!! Too funny! The Reid is just TOO CUTE! Love it! The Reid is adorable. Oh my gosh, this is soooooo cute. How can you help but love it? I love to see what each of their eccentricities are going to be. That is too funny. Thanks for making me laugh. Great pics.